Pioneers of this magical instrument the UK’s Danny Cudd and Sweden's Markus Offbeat became an overnight viral sensation in 2011 when their video and music release ‘Once Again’ was viewed over 30 million times on Youtube alone. Since then the duo have toured over 30 countries, amassed more than 100 million online views, around 250 thousand facebook likes, plus followers on Twitter, Instagram, their fanclub and other social medias. They’re proving that the wonderful healing sound of their instrument moves and amazes people across the globe evoking timeless feelings in the human spirit. 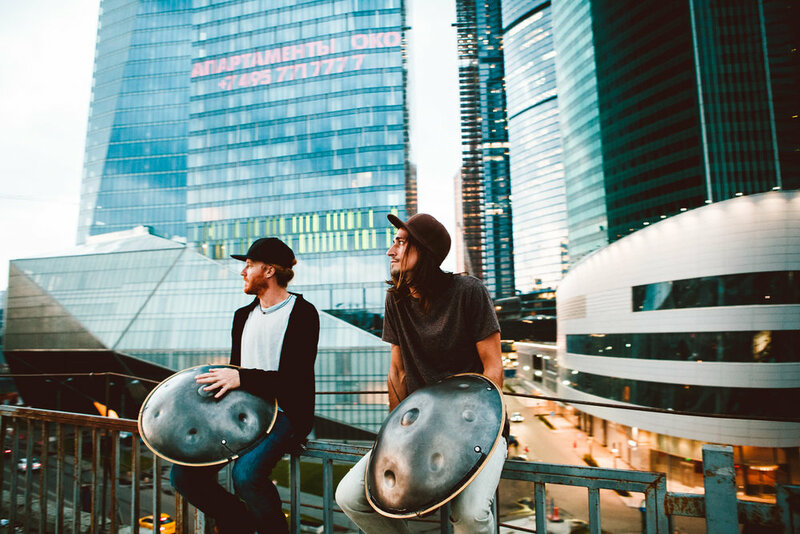 Hang Massive have established themselves as worldwide leaders in the Hang or Hand Pan, an instrument that’s still only 20 years old. Hang Massive’s live show is constantly being refined and in 2019 shows will include amazing new visuals, triggered sound effects and samples, all complimenting the Hang’s rich sound. Their latest offering, the 2018 album Luminous Emptiness will thrill fans and newcomers both recorded and live, and will be performed alongside the tracks that have made the duo a household name. Having played countless venues around the world, to audiences of up to 1500 a night, the duo are making themselves available for festival shows for the first time, for a new exciting chapter in the Hang Massive story.